Today's post is a simple then and now exercise. The first photograph, below, shows the corner of Eagle St and Charlotte St in the city way back in 1959. The buildings visible are, left to right, Naldham House, Ryan House and the awning to the Queens Hotel. Out of picture to the left would have been the Eagle St wharf area. Fast-forward 55 years to today's image, below, and there is a quite different streetscape. On the far left of the image is Waterfront Place, a 40 storey building that was completed in 1990 on the site of the old wharf. Next to it you can just see the tower of Naldham House, still there, although dwarfed by taller buildings in the background. It is now the home of the Brisbane Polo Club. The gold building in the centre is AMP Place, 35 storeys, finished in 1978. AMP built this tower as its state headquarters and moved their operations down here from their older building that is now known as Macarthur Chambers. The blue building on the far right of the picture is Comalco Place, also originally built by AMP, and which was completed in 1983 and is 35 storeys high. These buildings are simply known as the Gold Tower and the Blue Tower. 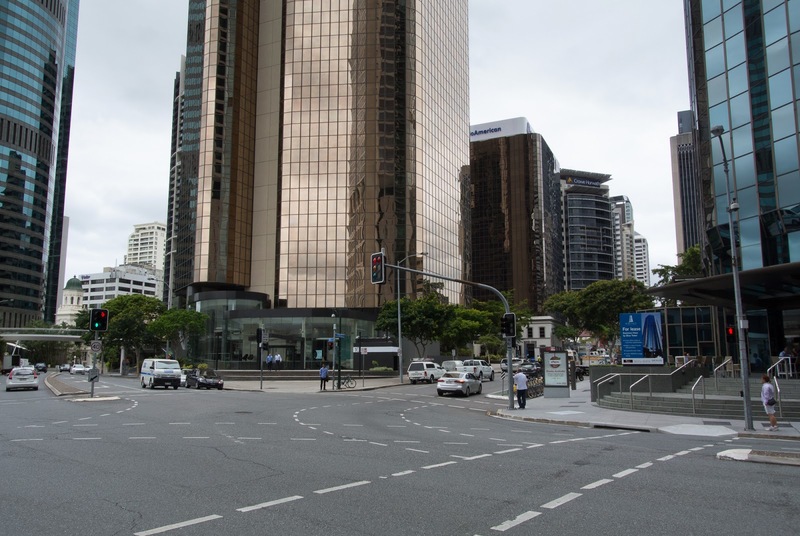 These buildings and the others in the background of the photographs are a visible example of the changes in Brisbane over the past 50 or 60 years. The arrival of fast elevators and modern construction methods have just about killed off the old three and four storey walkups. I began working for MacDonald Hamilton & Co just after they moved from Naldham House to Wharf Street in the eighties. Our front desk was a lovely piece of joinery which had been removed from the original building - I think this coveted piece of furniture went to a Sydney warehouse when Howard Smith wound up the MacDonald Hamilton/Inchcape/United Salvage Brisbane offices in the early 90's. I'm so glad Naldham House has survived the ravages of Brisbane's progress - it's a beautiful building. You can now get a nice view of it dining in the restaurant "Spring" in a renovated building across the road in Felix Street. I agree with you - it is a beautiful building and well-suited to its new purpose. I am also thankful that it survives.